Looking for a tropical vacation where you can balance beach time with shopping, nightlife and quality cuisine? Consider Honolulu: Hawaii's capital and gateway to America's favorite archipelago. 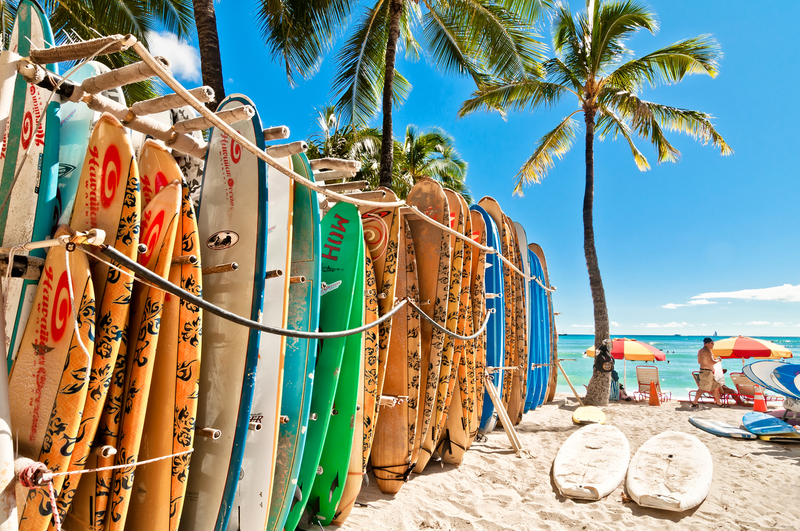 The city not only has iconic hotels and tourist attractions like Waikiki, but it also boasts thriving commercial and arts districts, as well as easy access to outdoor excursions that bring you face to face with Hawaii's natural beauty, whether at sea or on land. It's more doable than you think. According to travel site Skyscanner, there are plenty of flights from San Jose to Honolulu in the next few months, and the prices aren't too shabby. The cheapest flights between San Jose and Honolulu are if you leave on March 5 and return from Hawaii on March 7. Alaska Airlines currently has roundtrip tickets for $316. There are also deals to be had in April. If you fly out of San Jose on April 9 and return from Honolulu on April 11, Hawaiian Airlines can get you there and back for $323 roundtrip. Regarding where to stay, here is Honolulu's top-rated hotel, that we selected from Skyscanner's listings based on price and customer satisfaction. If you're looking to treat yourself, there's The Halekulani, which has rooms for $490/night. Located in the heart of Waikiki, this five-star beachfront resort is one of Hawaii's finest. Luxury shopping and dining are all within walking distance. Honolulu has plenty of top-notch dining options. Here are a few of the most popular, according to Skyscanner. If you're looking for a local favorite, head to Leonard's Bakery, which has an average of 4.5 stars out of 126 reviews on Skyscanner. "I had my very first malasada here from Leonard's Bakery," wrote visitor Tilly. "Malasada is a popular sugary doughnut that is crispy on the outside and soft on the inside when eaten fresh and hot. They are delicious." Another popular dining destination is Duke's Waikiki, with 4.4 stars from 105 reviews. "Duke's is the place to go for a fantastic dinner on the slightly more upscale side," wrote reviewer Makiah. "Situated right on the beach, Duke's has great food and amazing Mai Tais. They also have live traditional and local musicians." Also worth considering is Moke's Bread and Breakfast. "I love that all their breads and muffins are made fresh daily, and when they're gone for the day, they're gone," wrote John. "If you like pancakes and a touch of tropical deliciousness, order the Lilikoi Pancakes!" Honolulu is also full of sites to visit and explore. Here are some popular attractions to round out your trip, again from Skyscanner's listings. First up is Hanauma Bay State Park, easily home to the best snorkeling in Hawaii thanks to a strict effort to preserve this last remnant of Oahu's once sparkling reefs. "If you have time to come here to snorkel, it's one of the top-ranked spots on Oahu," wrote visitor Kat. "You pay $7.50 for admission and you have to watch a quick 10-minute video as an orientation." Lanikai Beach, another popular destination, is one of the most picturesque beaches on Oahu. It's home to sand so fine it almost gains a pinkish hue, a glistening stretch of turquoise water and, of course, Na Mokulua. "One of the most famous beaches in the world," wrote visitor Makiah. "Lanikai is absolutely perfect. The sand is soft, the waves are mild and the water is warm and clear." Finally, spend some time at Makapuu Lighthouse Rd. "If you're out of shape, this uphill walk isn't easy but it's doable," wrote visitor Lynda. "Nice views and rest area along the way."